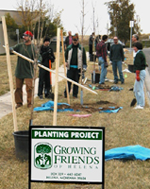 In addition to its planting programs, Growing Friends educates the public and decision makers, and encourages and assists local government. annually placing a “tree care” insert in the City’s water bill mailing. assisting local government – in the development of ordinances and tree-funding mechanisms. publishing “Putting Down Roots” – a 64-page tree selection and care handbook for the Helena. co-sponsoring Trash For Trees – a semi-annual recycling event (1990-2011) which Growing Friends organized for 20 years.